The recent explosions and fires at two sawmills in B.C. have united the industry like little before, and all involved are working hard to determine the causes—and prevent it happening again. The start-up of Millar Western’s new $50 million Fox Creek sawmill, capable of twice the production of its predecessor operation, has become a source of pride and joy for company employees and the Fox Creek community. Stimson Lumber is taking advantage of the slower economy to make an investment in its stud mill, including the replacement of its canter and an upgrade to an optimized double length in-feed scanning system. Tigercat’s new 880 machine is proving to be a fuel-sipping processor, while still delivering the goods, at Suncoast Logging on the west coast of Vancouver Island. Tigercat’s new 880 machine is proving to be a fuel-sipping processor, while still delivering the goods, at Suncoast Logging on the west coast of Vancouver Island. Meanwhile, an 880 log loader is receiving the “thumbs up” working for logging contractor Blue Valley Enterprises in B.C.’s Central Interior. Two Case 921 wheel loaders have gone the distance—and then some—at West Fraser’s Quesnel sawmill, clocking in some amazing operating hours: more than 41,000 hours and 38,000 hours, with original engines and transmissions. As the new timber allocation on Haida Gwaii in British Columbia is put in place, the Haida Enterprise Corporation and its subsidiary, Taan Forest, will be looking at a number of initiatives to add value to the wood fibre, and provide jobs for the Haida people. The uncertainties around timber supply in Haida Gwaii have left some long-established and resourceful operations, such as O’Brien & Fuerst Logging and its pole plant, in limbo. The economic tsunami for Canada’s OSB industry—following the collapse of the U.S. housing industry—is finally starting to recede after five very long, and lean, years. Think your product is green? Prove it! With the Environmental Product Declaration (EPD) program, the forest products industry is challenging other building materials to back up any claims their products might be “green”. Included in The Edge, Canada’s leading publication on research in the forest industry, are stories on Canadian Wood Fibre Centre and Alberta Innovations – Bio Solutions research projects. 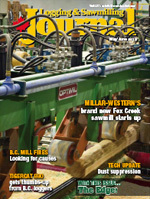 Logging and Sawmilling Journal has the latest product information on spark detection, dust suppression and fire suppression equipment in this issue’s Tech Update. Tony Kryzanowski wonders if the Stephen Harper’s government has left the building when it comes to the bio-economy file, instead choosing to focus on oil and gas. Many types of dust from industrial processes are combustible, and when fine combustible dust becomes airborne, it presents an explosion hazard. Reduction of that hazard requires a compressive combustible dust control strategy. Whether a business is looking for solutions for a particular problem, or just trying to learn more about this challenging problem, ETP Energy Technology Products is an excellent resource to call on, says the company. ETP Energy Technology Products has been providing custom solutions for dust control in B.C. since 1981. Dust control strategies and the systems to make them work are often unique to a process or facility, requiring problem solving in an area that many are not familiar with. If a facility is looking for new dust capture equipment, specialty explosion protection equipment to add to existing systems or industrial vacuum systems for better housekeeping, ETP Energy Technology Products’ solutions are leading edge, says the company, interms of solutions to dust problems. Dryer wood equals higher risk of dust explosions, says GreCon. The company adds that businesses can reduce risk with GreCon spark detection and extinguishing systems. Sawlogs from mountain pine beetle-killed trees are drier than green logs and can be under 16 per cent moisture. These logs have increased the risk of fire and dust explosions in sawmills where the risk wasn’t previously a concern. Reduced moisture increases friction and tool wear, which then increases the generation of sparks, embers and risk. Chipping dry wood results in more chip fines that are very dry and hazardous. Over-dried wood is more susceptible to breakage causing jam-ups at the planer, creating additional friction, heat and possible ignition. The GreCon spark detection and extinguishing system is a preventative measure, which detects initial ignition sources and extinguishes them before they cause a fire or dust explosion. Sparks and embers are extinguished without shutting down the conveying systems, damaging filter media, or interrupting production. The system is Factory Mutual Approved. CV Technology is devoted to the prevention, protection, and mitigation of industrial dust explosions and related fires with products like the Interceptor-QR. The Interceptor-QR is a passive explosion protection technology that mitigates the effects of a dust deflagration by allowing the hot gases and burning material to safely escape the vessel being protected. The Interceptor-QR has a built-in quenching chamber that traps the dust emitted from a deflagration and absorbs the heat from the flame and burning gases. The stainless steel mesh that comprises this chamber acts as a heat sink to quench the temperature and break the chain reaction, effectively interrupting the explosion in mid-stream. The dust and flame retention capability of the Interceptor-QR make it ideal for indoor explosion venting applications. With a simple installation, easy refurbishment, and process friendliness, the Interceptor-QR is a superior explosion mitigation technology, says CV Technology. The FLAMEX spark detection and extinguishing system is a cost-effective solution for the prevention of baghouse fires and explosions. Cutting, sanding, drying and milling operations can often cause sparks, which are typically the ignition source for process fires in wood processing facilities. The FLAMEX system uses infrared detectors to identify sparks being transported through ductwork to a dust collector. Upon detection, an extinguishing device creates a water curtain in the duct within a fraction of a second to effectively extinguish the sparks. The short spray time typically results in no downtime or clean-up. The system can also be programmed to activate deluge valves, alarms, abort gates, and equipment shut-down. FLAMEX is the first system of its type to gain Factory Mutual Approval, says the company. For over 30 years, the FLAMEX system has been successfully used in numerous woodworking and pellet manufacturing facilities throughout North America. The Air Mister is a proven way to control airborne dust and increase moisture content, says Van-Ed Equipment. Covering up to 3500 square feet, this unit produces a fine mist which collects small airborne particles and at the same time will cool the air. The spinning disc eliminates the need for nozzles and pumps, and mist output can be metered. All units have a water recovery system so water will not pool on the floor or machinery. These units are available as a ceiling mount or portable, and oscillation is also an option. All functions are on separate circuits. When misting is not required, simply switch off the water dispersing unit and run the fan to circulate room air only. Hansentek manufactures spark detection and extinguishment systems for the protection of dust collectors and air conveyance systems. A spark detection system is used in pneumatic particle transport systems where there is a potential for fires or explosions. These material transport systems include sawdust, cellulosic fibres, chemical dusts, food ingredients, pharmaceuticals or other combustible materials. Hansentek’s AN6400 is fully expandable up to 64 zones, yet is still competitive even for single zone systems. The company’s infrared spark detectors can detect and signal the presence of a spark in less than one millisecond. This quick response, coupled with Hansentek’s high-speed solenoid, ensures a full water spray pattern is established across the entire duct in a quarter of a second. The AN6400 was designed to give customers the utmost in protection, information and control with minimum service requirements. The system is Factory Mutual Approved. In any system that deals with the collection of dust particles, if there is a 3’ or greater unsealed distance between the dust collection hoods and actual dust sources, containment is required to improve the collection of dust particles. If dust collection hoods cannot be moved closer to the dust source, then the solution is to improve the system by providing a closely sealed route to control the path for air to carry the dust from the source to the pick-up duct. Installing a larger dust collection system does not alone improve the collection of dust; it is the containment of the airflow around the source of the dust that will increase the efficiency of the system. A well-sealed system of containment is both inexpensive, and far more beneficial in the creation of a successful dust collection apparatus. Successful and lasting containment has three symbiotic components: design must be borne within the mill, the machinery suppliers, and the dust collection people. However, what is most needed is an accessible design that maintenance and operating personnel can work with. Baum Pneumatics Inc. designs and supplies high pressure pneumatic conveying systems with B.C. and Alberta blowpipe installers, and can also supply feeder and blower rebuilds across Canada. The PyroGuard System, manufactured by Clarke’s Industries, Inc., is designed to detect and extinguish sparks in pneumatic conveying and material transfer systems. Infrared radiation is detected by the spark sensors, which in turn activates a solenoid valve to introduce an atomized water spray inside the duct. During a normal activation, production can continue, as only a limited amount of water is introduced into the pneumatic system. The system is typically installed prior to a dust collector and provides protection for plant personnel as well as equipment and assets. To supplement the PyroGuard system, Clarke’s manufactures a complete line of safety devices such as HiSpeed abort gates, backdraft dampers, and isolation dampers. In addition, Clarke’s offers the PyroComm Windows software package, providing for interaction from the PyroGuard Control Console to a PC unit. This powerful software program enables monitoring of the spark detection and extinguishment system from a remote location. MPS Talentum Fast Response Fire Detection Sensors are said to provide extremely quick detection of sparks or flame. They are available as front-viewing to cover rooms and open areas, or rear-viewing to monitor chutes, ducts, and various enclosed areas. A full range includes infrared (IR) dual-infrared (IR2), triple-infrared (IR3), and ultraviolet/dual-infrared (UV/IR2) to minimize false alarms from false sources of combustion. Adjustable settings include sensitivity and variable time delay. Fast Response Fire Detection Sensors are completely self-contained, requiring no external racks, cabinets, or controls, and can be operated off of just two wires, with a 4-20mA current loop. All sensors also include digital contacts. Rugged, durable die cast zinc alloy housings and quality components are used for long life indoors or outdoors, in tough environments. Production facilities can be protected from costly fires and dust explosions with Firefly, one of the industry’s most advanced and reliable technologies, says the company. Firefly offers unique solutions based on a range of patented components, and the company functions and co-operates with leading experts and institutions around the world to develop safe high-quality solutions. By tailoring a fire protection system using fast IR-radiation detection and flame detection in combination with effective water spray extinguishing and water mist suppression, Firefly aims to avoid costly fires and dust explosions in the woodworking industry. Spark and ember detection equipment supplier Sense-WARE poses the rhetorical question, can operations afford to lose their process because of a fire due to sparks and hot embers in their ductwork? Wood pellet producers can avoid significant fire damage and loss if they install a Sense-WARE “SenseTronic” spark/ember detection system, the company says. The SenseTronic IR-800/1, Sense-Ware’s lowest priced model, is suitable for ducts up to a 20” diameter. Installation would involve two detectors on the duct, opposing each other. 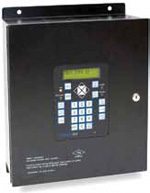 The alarm output can be connected to a Fire Panel or PLC. Sense-WARE’s fibre optics IRL-800/3 or the IRL-800/3REL with an optical self-test are suitable for ducts up to a 37” diameter with standard length fibres. 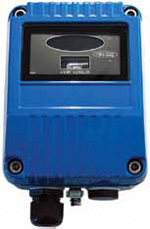 Both models have alarm and fault relays as well as a two-wire open collector output. Special order longer fibre optics is available for larger ducts. Scheuch’s proven air extraction, dust collection, pneumatic conveying equipment and systems for dryer and press exhaust gas cleaning have made the company a competent and reliable partner to the forest industry. The company’s comprehensive product portfolio includes innovative dust collection systems with a complete line of dust collectors, electrostatic precipitators, cyclones, pneumatic conveying systems, fibre sifters, fans and rotary valves. The Scheuch IMPULS bag house filter is a high capacity filtering separator that provides high cleaning performance with excellent removal efficiencies, says the company. The filter is used for dry separation of particulate matter, primarily for extraction of contaminants from machinery and workplaces, and as a process filter in material recycling or for dust collection in material handling and conveying systems. The company’s focus is on supplying highly efficient and state of the art technology to keep plants clean and safe by minimizing risks. Scheuch also offers innovative safety features for fire protection and explosion prevention to meet applicable codes and that guarantee operational safety and efficiency. Along with dust collectors, Scheuch developed and supplies other state of the art technologies for the wood industry such as dry and wet Electrostatic Precipitators (ESPs). Dry ESPs are used for flue gas cleaning on biomass fired energy plants, whereas wet ESPs are needed for cleaning dryer exhaust gases.